Breaks up congestion and stagnation of qi at the center, dispelling wind damp and wind to resolve spleen damp and tonify spleen qi. Use for poor digestion characterized by phlegm damp or food accumulation with symptoms of vertigo, headache, pasty/loose stool, flatulence. Excellent for wind damp invasion (i.e. summer stomach flu), motion sickness, cholera. Directions for Use: Take 8 pills three times daily with warm water. 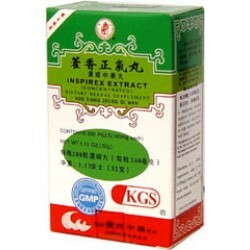 Ingredients: Chinese giant hyssop, bai zhu atractylodes rhizome, dried rind of mature fruit tangerine, pinellia rhizome, magnolia stem, platycodon, Chinese licorice root, fragrant angelica root, tangerine outer peel, poria sclerotium, perilla leaf, jujube fruit, fresh rhizome of ginger. Certified GMP by Lanzhou. Contents: 200 pills. 1.13 oz, 32g.